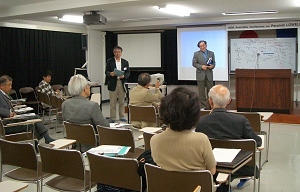 The Lowell Conference shall be held from 2 May to 5 May 2004 at Anamidzu under the auspices of the OAA Mars Section, the OAA Historical Section, the Lowell Society of Japan, the Toyama Yakumo Kai (Lafcadio Hearn Society of Toyama) and the Kanazawa Hoshi-no-Kai. At about 1 o'clock pm on 2 May we shall go on board a cruiser boat at Wakura and follow the same sea-route to Anamidzu as Percival LOWELL took in May 1889. Anyone who is interested in the Conference as well as the expected programme is welcome to contact and ask the Secretary general, Masami MURAKAMI (cmo@mars.dti.ne.jp). 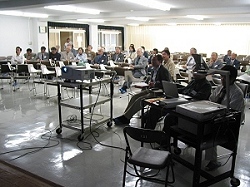 The Lowell Conference, under the auspices of the OAA, Lowell Society of Japan, Lafcadio Hearn Society of Toyama, and Kanazawa Star Association, was successfully held from 2 May to 5 May at the Anamidzu-Bay Institution of the Kanazawa Institute of Technology. Participants entered Anamidzu on board a cruising boat from Wakura on the afternoon of 2 May (as Lowell did in 9 May 1889), and the Conference started from 16:00. First MURAKAMI, CMO/OAA, brought forward a general view of what are suggested as the possible problems or modern implications of Percival LOWELL, and NAKAJIMA summarised the biographical history of LOWELL from 1855 to 1916. Then OBI, President of Lowell Society of Japan, talked about Boston related with the Lowell family. After the banquet, SATO talked about an interesting story about the SAHEKIs related with LOWELL, and then SHEEHAN gave a general talk about LOWELL and Mars. On the morning of 3 May, YOKOO touched on the modern investigation of the ET as well as the old study by William S CLARK, and HIRAOKA mentioned about LOWELL's Occult Japan. MINAMI then discussed how faulty as well as out-of-date the evolutional theory employed in The Soul of the Far East as well as in Mars is from the structuralist point of view. 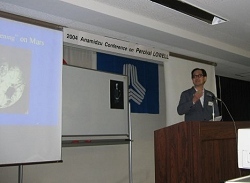 In the afternoon, after the Annual Meeting of the Lowell Society, ITOH gave a talk on the Lowell Observatory. MINAMI then talked on Lowell's Observations of Mars in 1894. SHEEHAN touched on the Lick Observatory, in relation with the Venus Transit in 1882 and BARNARD's Mars observations. In the evening session, SATO listed the Lowell documents filed in Japan, and TAKANARI talked about the delicate contrast between HEARN and LOWELL. Finally, MAKINO put forward a new finding about LOWELL's footprint at Ashikura, Tateyama, and OKUMURA talked about the possibility of LOWELL and AGASSIZ's going down the Tenriugawa in 1891. This session of the Lowell route was continued by OSA on the morning of 4 May who gave recently an interesting solution to the mystery of the Arayama Pass and the Lowell Noto Highway. 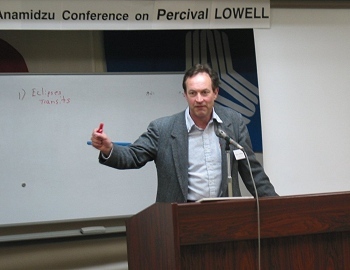 After the Lowell Festival of the Anamidzu Town (where SHEEHAN played a role), MURAKAMI closed the discussion on the Lowell route by showing a series of slides along the Takasaki line where LOWELL took a train from Tokyo to Nagano. NAKAJIMA and MINAMI added talks a bit on James Russell LOWELL, Robert LOWELL and Amy LOWELL. From the evening, the 12th CMO Meeting of the Planetary Observers was held, and MINAMI and SHEEHAN talked about the general aspects of the 2003 Mars, and ADACHI showed an artificial movie of the December storm in 2003. IGA then talked about the recent observations of Jupiter. On the morning of 5 May, MINAMI gave a last talk on Lowell's Mars, and then AKUTSU closed the session by showing his work in 2001 and 2003. During the Conference, the chairs were taken by ASADA, HIRAOKA, MINAMI, MURAKAMI, NAKAJIMA. Photos and Video were taken by NAKASHIMA, MINAMI, MORITA, AKUTSU and others. We are sincerely thankful to all participants of the Conference and to the KIT for their kind support. 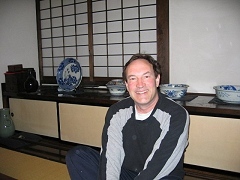 We are happy to inform that Bill SHEEHAN arrived at Japan on 22 April, and safely left from Narita to Minnesota on 9 May 2004 as scheduled. During his stay, he was awarded an OAA Medal and gave a talk on the Venus Transits on the occasion of the OAA Annual Convention at Nagasaki. He also gave talks five times on Mars/LOWELL at the Anamidzu Lowell Conference. He of course exchanged mutual friendship with some of CMO members from 1 May at Anamidzu. 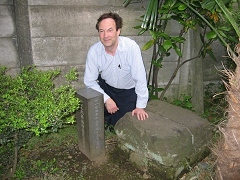 In addition, Bill visited all of observing sites of the 1874 French, American and Mexican expeditions in Nagasaki, Kobe and Yokohama. As well, Bill traced principal parts of the route where LOWELL took in 1889 when he made a trip to Noto. Bill also visited the Saji Observatory and Hida Observatory guided by Tadashi ASADA. The photos here show Bill at the Kikyo-ya at Shimo-no-suwa and also at the Nogeyama observing site of the Mexican team in 1874 (guided by Toshio SATO). Click the banner of Bill SHEEHAN Site on the right-hand side. On 15 September 2004 at 13h GMT the planet Mars was in conjunction with the Sun. See the three day set of SoHO LASCO C2 images here. Henceforward, Mars will go to shine in the morning sky and gradually approach the Earth. On 1 January 2005, the apparent diameter will reach δ=4.2" with λ=137°Ls. Next opposition will occur on 30 October 2005 with the maximal apparent diameter δ=20.17". The 2005 season of Mars has started. 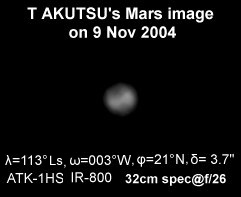 On 9 November 2004, Tomio AKUTSU caught a first light of the planet at dawn. The Martian season was at λ=113°Ls, while the angular diameter was 3.7 arcsecs. The IR image shows the surface of ω=003°W, and M Acidalium is apparent. T AKUTSU then took another image on 22 November at ω=237°W. M MINAMI also tried to watch visually on 22 and 23 Nov to find faint markings just before the Sunrise. In mid-Dec, the angular diameter will reach 4.0 arcsecs.